Holley Dominator carburetors were designed specifically for producing top end horsepower and torque in high-end racing engines. Those with three circuit metering add a level of transition which requires less pump shot. 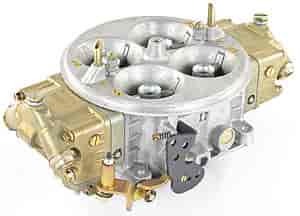 Offered in 750, 1050, 1150, or 1250 cfm, review the features below to choose the best carburetor for your specific application. These kits, put together by JEGS Professionals, includes Holley Carb, JEGS Fuel Line, JEGS Fuel Pressure Gauge and JEGS Fuel Filter. JEGS 50008 - Air Cleaner with Smooth Top 14 in. x 4 in.